Now something is finally ready. On 10 April 2019, at 15:00 CEST (13:00 UTC, 9:00 EST) the European Commission, European Research Council, and the Event Horizon Telescope (EHT) project will present results they are describing as "groundbreaking". As they note, "due to the importance of this result, we encourage satellite events in the different ESO Member States and beyond." 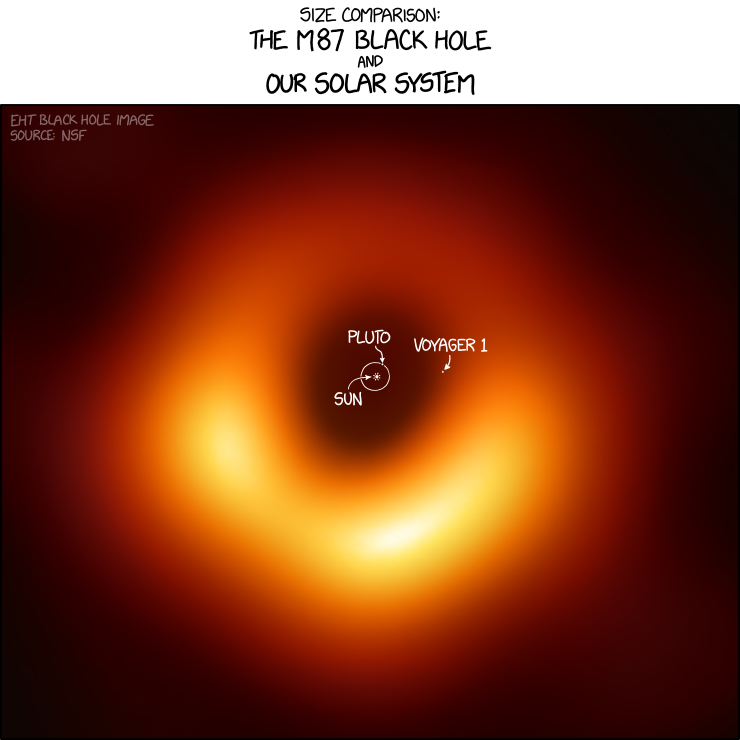 Now we've all been burned many times by NASA but given the purpose of the EHT and how much they're playing up the importance, it seems we really will finally see the first photograph of a black hole's event horizon! So mark your calendars and tune into the youtube livestream April 10, 9:00 EST! First image of the black hole in the galaxy M87! 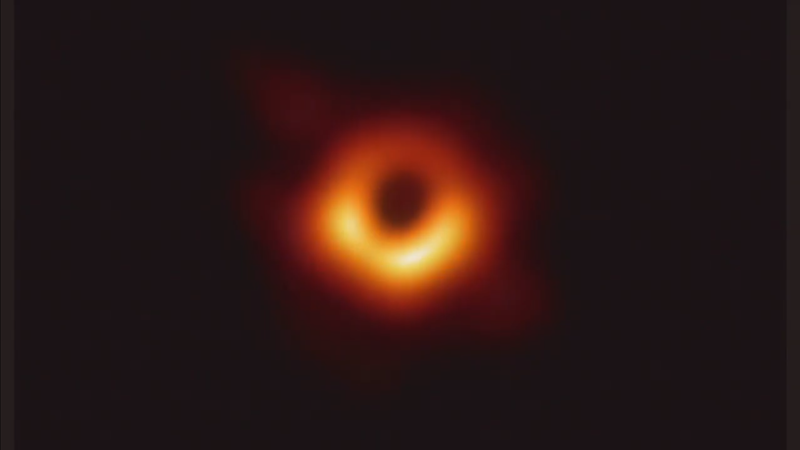 Two things, the black hole is 50 micro-arc seconds across, which makes it one of the smallest by apparent size if not the smallest object we've ever imaged. It's also almost a monster. PS: Please give Likes on that thread to those first four posters and no me. Thank you. Actually, it is based entirely on the rocket equation. Anything that is within the event horizon cannot escape the black hole under its own energy, because the escape velocity from that point is the speed of light. That is all there is to it. With a black hole the size of this one, the force of gravity at the event horizon can be low as 1g. So if you had a bussard ramjet that could survive the heat of the accretion disk, you could dip bellow the event horizon of a massive black hole like this one, and then climb back out. You'd just need to push out multiple times the mass of your space ship in propellant to escape the gravity well completely. No particle with mass can ever reach the speed of light, as it will required an infinite amount of energy to do so. At the event horizon of a black hole, not even the mass-less photon - moving at light speed - can escape the influence of gravity. Any sort of reaction-based propulsion system can only impart finite amounts of energy. Therefore, no propulsion system will suffice to impart the infinite amount of energy anything with mass would require to reach luminal velocity and escape from the event horizon, nevermind the transfinite amount of energy required to escape from below it. So if you had a bussard ramjet that could survive the heat of the accretion disk, you could dip below the event horizon of a massive black hole like this one, and then climb back out. You'd just need to push out multiple times the mass of your space ship in propellant to escape the gravity well completely. Guys and Gals. Vorpal is not coming. At least not fast. He is spending a lot of time on Frozen In Carbonite. Yet another one of SB's sister sites. I am making a thread there. There's a potentially confusing matter in that in common usage, ‘surface gravity’ of black hole has a technical definition distinct from the thrust of a rocket it would take to remain stationary (say, for a Schwarzschild black hole for simplicity). If you're hovering around a black hole, in the limit of coming closer to the horizon, it would take infinite acceleration to remain outside of it. So in that sense, one could say that the surface gravity of a black hole is always infinite—but that's not how the term is actually used. The reason that that's not how it's defined is because the alternative has much interesting properties than ‘it's just infinite’, both mathematically and physically. Instead, it basically amounts to that hypothetical rocket acceleration rescaled through a time dilation factor to an observer at infinity (there's a formal geometrical definition that's more involved, but this is good enough). That quantity can indeed be as low as 1g or less, for sufficiently large (or fast-spinning) black holes, but it no longer has a direct connection to the local thrust a rocket would need to provide. Instead, it directly corresponds to the temperature of Hawking radiation a distant observer would measure, so it links much better with black hole thermodynamics. A close stationary observer would measure this temperature diverging to infinity as they come closer to the event horizon. By the way, the notion that gravity is unlike other forces is or that we don't understand why gravity curves spacetime is pretty misleading in that it at best it characterises pre-1960s relativist views. Suffice to say, physicists have learned various things about gravity since then. For example, one way to think about why gravity can be understood as spacetime curvature is because of its universality in coupling to all energy-momentum equally, regardless of composition, and in turn that is a provable theorem about a force mediated by a massless spin-2 field in quantum field theory, which was shown in the late 1960s. Can I post this on SB in the thread?